Still playing catch up but luckily I didn’t lose both days this weekend while at the 24 hour movie marathon. A blog on that will be coming soon. For now, continuing the challenge. Day Fifteen – What is one of your favorite science fiction horror films? There are so many to choose from for this that it’s hard to really pick one. Since I’m trying to stick to the idea of not repeating titles for this challenge it did make it easier. I easily could have gone with THE THING or even THE FLY or another famous one which may show up in a future post … we shall see. 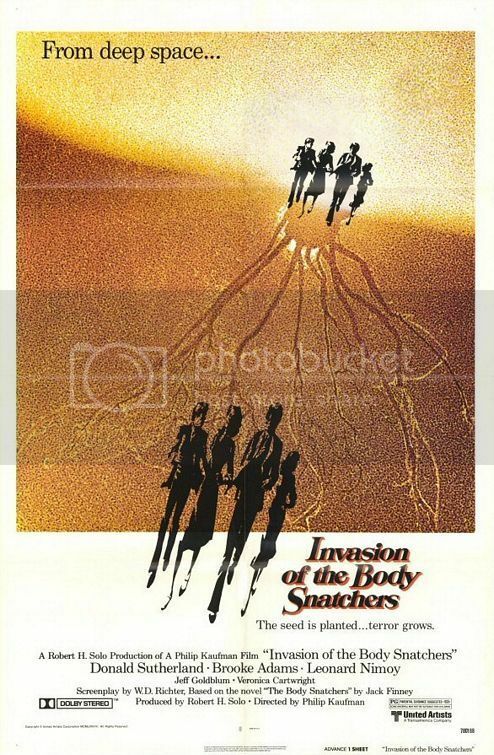 I decided to go with one of my favorites, Philip Kaufman’s 1978 version of INVASION OF THE BODY SNATCHERS. There have been several versions of the story involving aliens coming to earth in the form of pods which absorb our life essence while we sleep to recreate a clone to live in an alien populated world where people are sort of the same except devoid of basic emotions. Basically it’s the ultimate communist/socialist dream where everyone is the same without succeeding or failing but robbing people of their individuality and the essence of what makes each one of us unique. A backdrop theme prevalent in the amazing Don Siegel original INVASION OF THE BODY SNATCHERS from 1956. The one thing that has always struck me about this 1978 version is, as is the key for this challenge, I’ve always thought this version was so scary. It does a great job of showing us day to day life and then we see here and there where things start to change. Moving the setting from a small town to a big city, San Fransisco to be specific, also creates a greater feeling of dread being in such a heavily populated area. When more and more people start to show up different it becomes so much more terrifying. The blank stares of people in the streets becomes greater as it becomes more evident that they have taken over. The feeling of being outnumbered also plays better in the urban setting. A sense of desperation hovers over everything which by the end of it you almost feel drained yourself. Once again this is a good example of taking the same basic concepts and making it your own as I’ve mentioned with remakes of other films. While Siegel’s film is the more relevant one in many ways (unfortunately even now with current situations) the Kaufman one is a darker film and a flat out scarier one in my opinion including a very chilling ending. Plus how can any of us ever forget the one malformed pod person, the dog with human head. That alone is enough to give you the willies.